These are my mom’s favorite cookies and lately she’s been demanding them to be sent via care package to her home. Aren’t mother’s supposed to send their children care packages, not the other way around? I never did mail a package to her, so instead I made them while I visited this weekend. It’s not quite the same as getting a box in the mail, but hopefully she’ll forgive me. I also took a few photographs of my new niece Rowan while I was there. I’ve forgotten how small babies are! They're such cute little grumpy aliens. It took some time to get a photograph where she didn’t look like she wanted to protest this strange new world, but I was armed with my camera when she smiled a little in her sleep. I didn't even bother fighting for an open eye shot. Although mom did try to wake her for one. I’ll try again when she’s a little happier with all of us. I figure I’ve got years to chase this kid around with a camera. This recipe is simple, but the dough should rest in the refrigerator for a couple of hours and cure overnight after baking for the best cookies. So try to plan a day in advanced. But if you don't have extra time don't worry about waiting, just bake them right away. 1. 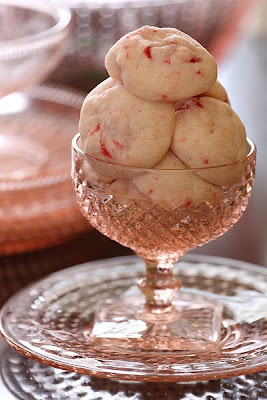 With an electric mixer beat together the sugar, butter, salt, maraschino cherry liquid, and almond extract. Once combined, add the flour and mix until just incorporated. Add the chopped maraschino cherries and mix together. Cover and refrigerate for a minimum of 2 hours. 2. Remove the dough from the refrigerator and set on the counter for 30 minutes. Meanwhile preheat the oven to 350 degrees and line two cookie sheets with parchment paper. 3. Scoop the dough with a standard (size 50) cookie scoop and roll into balls. Place 1 inch apart on cookie sheets and bake one sheet at a time for 9 to 11 minutes or until very lightly brown on the bottom. Let rest on the cookie sheets for a few minutes and move to a cooling rack. Once cool, store in an airtight container to cure overnight before serving. Recipe and Picture by Laura Flowers. These sound so delicious with Maraschino's in them! Buttery, tender and so sweet. Your niece is precious! Does Pre-February unconscious thoughts involve cherries? Or perhaps red? I just saw another post where she had made chocolate cookies with a cherry in the center, and lightly dusted with powder sugar...love is in the air, for me anyway...I am seriously thinking you and her have stolen my heart! When you get a chance take a look at a 'Juicy' post on my TMI, you food photographers know how to send my taste buds reeling! The photo of your niece is adorable! I was just stopping by to get your chili mac recipe and noticed this new post. And may I just say "AWWWWWWWW!" You did good, Aunt Laura. 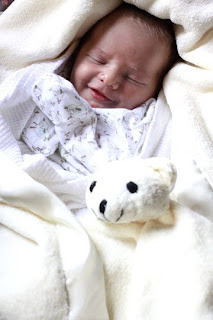 I know newborn babies do get that grumpy look a lot but your tenacity proved fruitful with this wonderful pic of her smiling. It's unreal! I'm glad you got to visit your family again, and these cookies look really really yummy. I will have to try that recipe out on Den's co-workers. I had to delete the last comment I made - apparently, I can't spell. Anyway, these cookies are my favorite kind of recipe - simple and delish! They look great - and so does that little one smiling! I've never sent my mum a care package. Ouch! I love receiving them from her though! She often spoils me with lots of yummy British goodies that I miss so much. Your cookies sound delicious and your niece is adorable! Right up my alley. I love anything with cherries and these look amazing. Thank you. Cookies look fab, Laura. But, your neice is SOOOOOOOO PRECIOUS! enjoy her, they grow fast! I love the maraschino cherries in this, it's different but it sounds delicious--the red specks are so pretty. And, what a doll your niece is. Sweeet! Wow, they look delicious! The maraschino cherries might have an incredible flavour in the cookies - no wonder your mother likes them that much!! Your niece is lovely, the picture is really beautiful! Rowan looks like a porcelain doll! These cookies look yummy! ps e-mail me at christineinnewyork (at) gmail. I'm going to have limited acess to the Internet in France, so ping me soon. Can't wait to meet you! That picture of your niece just makes me smile! She is adorable! And those cookies - they looks so elegant, I am sure your Mom would much prefer you make them for her in person! Rowan is beautiful (love the name too). I hope you keep us updated with lots of photos. These cookies look fantastic. Hubby loves cherry anything, so I will be trying these. Thanks for sharing. What a beautiful baby and delicious-looking cookies! I've never heard of cherry tea cookies. I'll be trying this one out for sure! It's much easier to take pictures of babies while they sleep haha! These are so dainty and girly looking that I can't resist. So is the texture very crispy? splendida la foto e favolosi questi biscotti!! complimenti!! Wow....mom's, babies and cookies all with a cherry on top! Wonderful visit. Congrats for being a new Auntie. Your mom must've been in heaven...hope she is doing well. Where in the world did you find a recipe like this. I've never heard of such a thing, but I'm hooked on the idea of it. I love almond and maraschinos, so I'll definitely be making these. They'll be a nice cookie for Valentine's Day. Is the overnight wait a taste advantage or a texture advantage? Are these a crisp cookie? They taste much more like cherry after the dough sits overnight and even turn more pink. I've made them often both ways, and resting the dough is way better. The texture isn't much different though. I don't think I have ever had these before. Definitely on my to try list. Oh, so sweet! Loved the photo of your baby niece, she's adorable (and those Cherry Tea cookies look pretty as well)! What a sweet baby! Reminds me of my nieces when they were small... It's so great to be an Aunt! Thanks for the recipe! I made them today, I should've doubled the ingredients, coz there's almost nothing left of it. Well, definitely will do next time. Awesome cookies! Thanks again! Judith I am so glad you enjoyed these! Thank-you for telling me. can't wait to make these cookies! I love cherry! This is a must try recipe! This sounds just like a cookie my family loves from Collin Strret Bakery in Corsicana,Tx. Thank you for sharing. hi Laura... I'm new to your blog but I'm a big fan of these cookies... I made them when a friend of mine was coming to stay for a long weekend... sadly her flight was cancelled because of all this snow in mid-atlantic, and I was FORCED to eat them all myself. I've been a closet fan of Maraschino cherries since I was a kid -- Somehow I have always felt like I should have 'outgrown' my love for that piercing cherry sweetness. Thanks for the recipe... and for helping me feel like I'm not alone in my love affair! Great recipie! I made these cookies last night and they have a great taste. However - after refigerating and letting the dough sit for 30mins - I rolled them into balls, placed them on the baking sheet and baked them. They didnt flatten out at all to look like your wonderful picture - they just stayed in the round shape and baked. So for the next batch I rolled them into balls but them flattened them with a glass and they preserved that shape as they baked. Can you think of a reason why that would happen? Sorry your cookies turned out kinda round. I'm guessing that my butter might have been a bit more melted or it could be because this particular batch I didn't have time to refrigerate before baking.